Today I will demonstrate setting up the HP LeftHand / StorageWorks P4000 VSA running within ESX4i. For this demonstration, we will pretend that we have a physical server capable of running ESX4i with one local logical drive, and then attached storage with two logical drives (e.g. 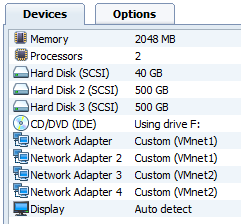 you might have fibre channel attached 14 disk shelf split into two RAID 5s of 6 disks plus hot spare.) 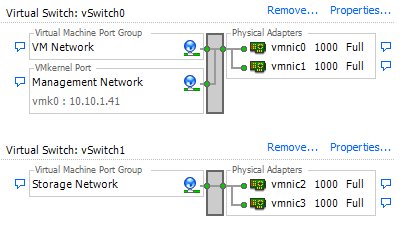 Also, we'll give it 4 NICs (you don't need to do this, 1 will be fine for the demo, in practice you'll want redundancy for your service console network, and storage network.) I say pretend since this entire demonstration will be running inside VMware Workstation 7. Once the VSA has booted (as above,) at the login prompt type start and press enter, and press enter again to login to the Configuration Interface. 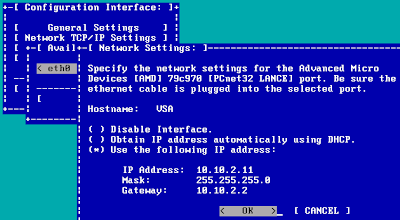 Use the arrow keys to navigate and select 'Network TCP/IP Settings' and press enter. Choose eth0 and press enter. 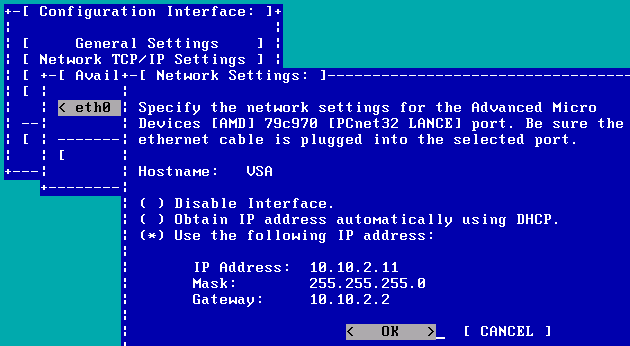 Configure hostname, IP Address, Mask, Gateway. If you've not already got it; install the Centralized Management Console (current version is CMC_8.5.00.0313_Installer.exe) on your workstation or a server. Double-click on the shortcut for HP LeftHand Centralized Management Console. On the Find Nodes Wizard, click Next, and search for your node via subnet or IP as desired, enter the IP addressing details, click Finish, click Close. 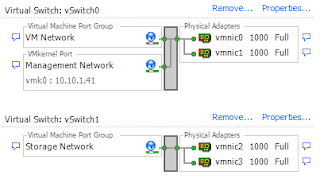 With the VSA up and running, the rest of the configuration is the same as having a physical appliance; this includes adding to a management group, adding to a cluster, configuring volumes, and configuring server access to these volumes. iv: Expect performance to be only 90% as good as a physical platform made out of similar hardware for small IO, random IOPS like databases. For sequential workloads, like file copies, cloning, backups, streaming, etcetera … expect performance to be only 60% to 70% as good as the physical platform made out of similar hardware.